Be there when a false hex quiz assignment causes excitement. 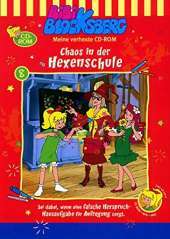 Bibi, Flauipaui and Schubia have real stress in the witch school, because Aunt Amanda has given them homework in the herb hour. Every young witch must learn a sorcery spell from the Great Herbalism Guide. That means cramming - of all things, when there's a fair in Neustadt! Of course, the girls do not want to be deterred from going there, because they do not want to miss the big opening ceremony at any price. And finally, you can try the new hexes there as well. But then the hustle and bustle suddenly turns haywire: the ferris wheel does not stop spinning, creepers sprout on the ghost train, and Aunt Amanda suddenly behaves like a baby. Bibi, Flauipaui and Schubia are at a loss. Is that her fault? Experience an exciting day at the Neustädter Kirmes with the young witches and help them to find out what is behind all the chaos.